We’d love your help. 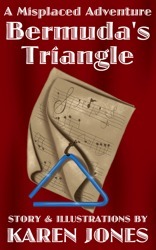 Let us know what’s wrong with this preview of Bermuda's Triangle by Karen Jones. Screeching violins, rasping clarinets, and drums beaten to death were just the beginning. Bermuda longed to be part of the school band. She tried countless instruments, but couldn’t make any of them produce pleasing sounds. Her parents were ready to give up. Her music teacher was at her wit’s end. But her friends had an idea. Bermuda's Triangle is a musical adventure for be Screeching violins, rasping clarinets, and drums beaten to death were just the beginning. Bermuda longed to be part of the school band. She tried countless instruments, but couldn’t make any of them produce pleasing sounds. Her parents were ready to give up. Her music teacher was at her wit’s end. But her friends had an idea. To ask other readers questions about Bermuda's Triangle, please sign up. This illustrated children's book is beautifully written in language that's easy to read and a joy for young and old alike. The chapter layout makes kids feel like they've graduated past baby books but the chapters are nice and short so as not to overwhelm early readers. The author's illustrations are to die for, making Ms. Jones extraordinarily multi-talented! How will Bermuda finally wind up playing the Triangel?